When you step inside our line of portable restroom trailer facilities, you will find luxury. We have the perfect trailer facility for any size event from a wedding, family reunion, concert, or a school function. Whatever your need may be we have the portable trailer facilities for you. When it comes to comfort and style for guests, we have taken care of everything for you. Comfortable, convenient facilities will make your guests know they are special and appreciated when they can enjoy one of our portable restroom trailer facilities. We have provided all of the modern conveniences for your guests to enjoy such as private rooms, automatic faucets, and beautifully decorated interiors. A lean, efficient, and economical alternative, featuring vent fans, flip down steps, and swing out hand rails. The Economy Trailer is equipped with a 125 gal. Fresh water tank and a 255 gal. waste tank yielding 750 uses. 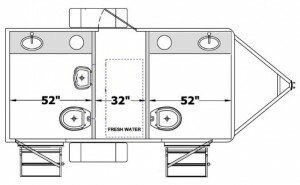 Our most popular model, the Private Portable Restroom Trailer features 2 private rooms. Large porches, stainless steel hand rails, AC/heat, and heavy duty flooring are all standard on this unit. This trailer is equipped with a 125 Gal. fresh water tank and a 370 gal waste tank yielding over 1,100 flushes. The perfect solution for the most common events – weddings, parties, fundraisers, and VIP areas, the High Volume Portable Restroom is a “no-brainer”. 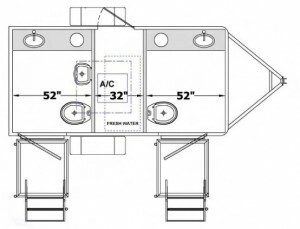 With 1 private men’s and 2 private women’s, this trailer is capable of accommodating crowds of up to 300 for 6-8 hours. A 500 gal. 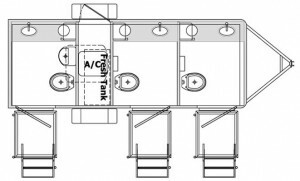 waste tank allows for approximately 1,500 flushes and is also equipped with a 125 gal. Fresh water tank. The “ultimate crowd pleaser” the Deluxe Private Portable Restroom Trailer satisfies larger crowds with style and comfort. Five individual private rooms with 2 men’s and 3 women’s can accommodate 500 guests or more for 8 hours. The 870 gal. waste capacity yields approximately 2,600 uses and supplies 250 gallons of fresh water. The Deluxe Public Portable Restroom Trailer is one of the most popular mobile restroom solutions on the market today. A “public” style men’s and women’s configuration supplies 3 toilets/3 urinals on the men’s side and 4 toilets on the women’s. This restroom trailer efficiently accommodates crowds by utilizing doors on both sides. Portable Toilet Rental is committed to providing the best mobile event solutions in the industry. 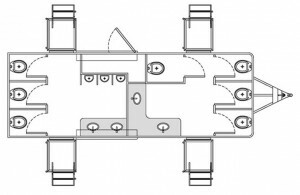 ADA compliant trailers, locker room, shower combination, laundry, cooling stations, and oil field consulting trailers are just a few examples of specialty trailers offered. For more information on renting one of these high quality, custom portable units, please call us at (888) 695-2443. Photos and product descriptions courtesy of AMS Global. Used by permission. Your exact rental unit may vary based on local availability. 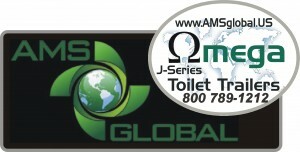 Call AMS Global or visit www.amsglobal.us to purchase trailers and other specialty units.